This year marks the Asia Injury Prevention (AIP) Foundation’s 15th year of working to prevent road traffic fatalities and injuries. 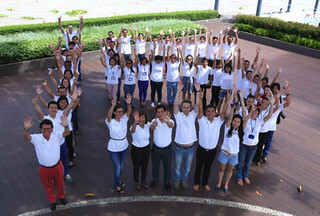 At a recent teambuilding gathering, together we reflected on past milestones, including the launch of Helmets for Kids in Vietnam in 2000 and its expansion in 2006 to Thailand and Cambodia, the establishment of the Global Helmet Vaccine Initiative in 2009, and more recently, the launch of comprehensive pedestrian safety programs in Vietnam and China. With our partners, we have drawn lessons learned from our interventions, and are continuing to examine future trends in successful road safety approaches. As we pass the 15-year mark and look forward, AIP Foundation will continue with its commitment to reducing road traffic fatalities and injuries in low- and middle-income countries. Please see below to read more on our activities and achievements throughout the month. Celebrating 15 years of road safety achievements. This year marks an important milestone for AIP Foundation as it celebrates 15 years of implementing road safety interventions in low- and middle-income countries. Starting in 1999 with three employees in Vietnam, AIP Foundation has grown to over 60 employees worldwide. During these past 15 years, AIP Foundation has built and supported effective road safety methods in Vietnam, Thailand, Cambodia, China, Uganda, and Tanzania, where motorcycles are largely the principal means of transportation. AIP Foundation is encouraged by the achievements made in the past 15 years, and looks forward to more progress and impact in the years to come. AIP Foundation will continue to support efforts that provide life-saving traffic safety knowledge and skills, with the ultimate goal of preventing road traffic fatalities and injuries. As the Millennium Development Goals soon also reach their 15-year mark, we strongly support the inclusion of road safety into the post-2015 development agenda. Click here to vote for your priorities. We ask you to vote for ‘better transport and roads,’ ‘better healthcare,’ and also suggest ‘road safety’ in the optional priority tab. Pope Francis tells of anguish as relatives die in Argentina car crash – Pope Francis has been deeply pained by the deaths of three relatives killed when their car collided with a grain truck in central Argentina, just hours after musing that he himself may only have "two or three years" left. A nephew of the pope, Emanuel Bergoglio, who was driving the car, was in serious condition after the accident just after midnight on Monday. The nephew's wife, Valeria Carmona, and two children, Jose, aged two, and Antonio, 8 months, died. "The pope has been informed and is deeply grieved by the tragic news. He asks all those who share his pain to join with him in prayer," said a statement on the website of Radio Vaticana. Source: The Guardian, 18 August. FIA Foundation’s US Director nominated by President Obama for member of the National Transportation Safety Board – On September 17, U.S. President Obama announced his intent to nominate Dr. Bella Dinh-Zarr as a member of the National Transportation Safety Board. Dr. Bella Dinh-Zarr is currently the Director of the FIA Foundation’s U.S. office. She served as FIA Foundation’s Road Safety Director from 2007 to 2014 and previously as Director of North America’s Make Roads Safe Campaign for Global Road Safety from 2006 to 2007. Read the press release here: The White House press release, 17 September. 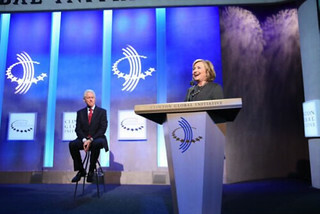 Bill and Hillary Clinton at this year’s Clinton Global Initiative Annual Meeting. This month, AIP Foundation CEO Mirjam Sidik attended the Clinton Global Initiative (CGI) 2014 Annual Meeting in New York City. Mirjam highlighted the staggering fact that currently, road traffic crashes are the number one killer of young people globally and spoke with others on their overlapping goals to prevent the loss of lives in the developing world. In 2010, AIP Foundation committed with CGI to reducing road traffic fatalities and serious injuries by promoting safer behavior among road users and increasing access to high-quality helmets. Read AIP Foundation’s CGI Commitment to Action here. An artist's impression of a terminal section of the Ben Thanh-Suoi Tien metro line that is under construction in Ho Chi Minh City. Vietnam hub to begin construction of 1st metro line terminal — Construction of the first underground terminal of the Ben Thanh-Suoi Tien metro line in Ho Chi Minh City – the first of its kind in Vietnam – has begun. The system, estimated to cost US$2.49 billion, is designed to be 19.7 km long, running from District 1 through Binh Thanh District, District 2, District 9 and Thu Duc District in HCMC before reaching Di An Town in neighboring Binh Duong Province. 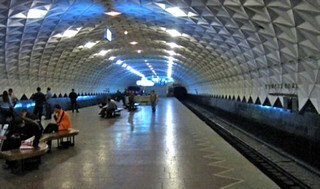 Of the total length, 2.6 km will run underground with three stations, while the remaining sections and another 11 stations will be constructed above ground. The metro line is scheduled to be completed in 2017 and put into operation in 2018, when it can transport about 620,000 passengers per day, the HCMC Transport Department said. Source: Tuoi Tre News, 21 July. AIP Foundation hopes the metro will reduce traffic congestion and lead to safer roads in Ho Chi Minh City. Ms. Susan E. Loftus of AIG Vietnam with AIP Foundation’s Greig Craft and students of Trung Vuong Primary School. 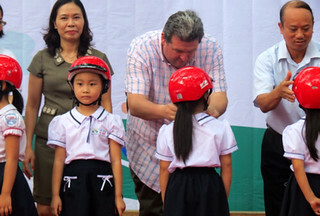 In a helmet handover ceremony, 1,925 high-quality helmets were distributed to students, teachers, and staff at Trung Vuong Primary School in Hoan Kiem District of Hanoi. The donation is part of the American International Group (AIG), a multinational insurance corporation, and AIP Foundation’s partnership to support the road safety initiative Helmets for Kids in Vietnam. 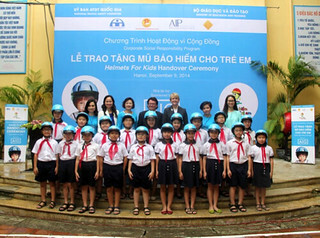 “The Helmets for Kids program is part of AIG’s global initiative to ‘Make the World a Safer Place’ and our long term commitment to working with communities across Vietnam in road safety,” said Ms. Susan E. Loftus, AIG Vietnam Chief Executive Officer and General Director. Helmet laws, with enforcement, are effective in preventing serious and fatal head injuries. Hats off to Vietnam’s helmet law – A decade ago, it wasn't unusual to see a Vietnamese family of five cheerfully braving the frenzied traffic of Hanoi on a single motorcycle — with nobody wearing a helmet. No longer. A stringent law passed in 2007 has made helmets compulsory — and has proven that such laws, which require political will more than money, can have a huge impact on public health. Research suggests that the law's passage saved more than 1,500 lives the first year and reduced serious head injuries by almost 2,500. Read the full article here: Science Magazine, 12 September. Helmet Quality campaign conducted by the government and Clear – On September 14, an event to support the national plan on helmet quality took place at the Youth Culture House in District 1 of Ho Chi Minh City. This is a result of the collaboration between Unilever Vietnam, the National Traffic Safety Committee, National Youth Union, and HCM Youth Union. The event attracted the participation of 3,000 youth with traffic safety games, awards, booths, a street parade, etc. The campaign was announced on March 28, 2014 and so far has collected around 15,000 pledges from people committing to wear standard helmets. Source: Tuoi Tre Newspaper (translated), 15 September. Mr. Paul Hillier, a National Technical Leader at ARRB, helps a student put on her new helmet. Supporting AIP Foundation’s Helmets for Kids program since 2011, ARRB Group celebrated its continued commitment to Ai Quoc Primary School with a distribution of important educational materials on helmet use in addition to a helmet “top-off” ceremony. 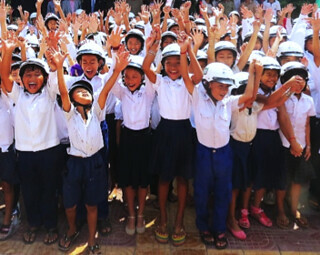 In total, ARRB Group, one of Australia’s most trusted advisors for road safety technical input, has donated 882 helmets to Ai Quoc Primary School over three years. In their first year of support in Hai Duong, Vietnam, ARRB Group donated helmets to all students and teachers at Ai Quoc Primary School. The following year, ARRB Group donated helmets to the school’s first graders, new teachers, and students in second through fifth grade at the school who had outgrown, lost, or damaged their helmets. ARRB Group is now distributing educational materials on helmet use to Ai Quoc Primary School students in addition to 240 new helmets. In addition to Vietnam, ARRB Group has also supported the Helmets for Kids program in Cambodia, and in 2015 will expand their commitment to Thailand. DSFL session trainees practice their new safe driving skills on the road. 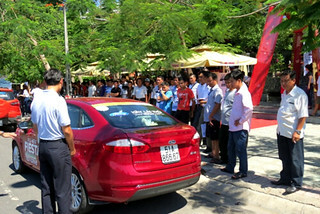 This month, AIP Foundation supported three Ford Driving Skills for Life training sessions held in Nha Trang. Approximately 60 people in total, including local community members, a representative from Nha Trang Traffic Safety Committee, and Nha Trang’s City Ford, participated. In addition to a formal training, the session utilized a nearby intersection to practice newly acquired skills. Using three vehicles, participants put lessons, including overall safety skills, saving energy, and keeping a safe distance, into practice behind the wheel. Head measurements ensure that students receive a properly-fitting helmet for an upcoming donation. 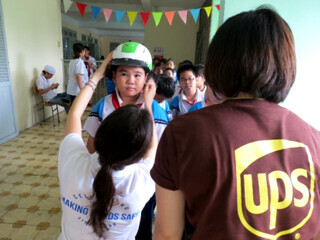 Eleven volunteers from UPS Vietnam and representatives from the AIP Foundation visited two primary schools in Binh Thanh District of Ho Chi Minh City to measure head sizes of more than 2,000 students for an upcoming helmet donation. This important step ensures that each student receives properly-fitting helmets and protection in the event of a crash. 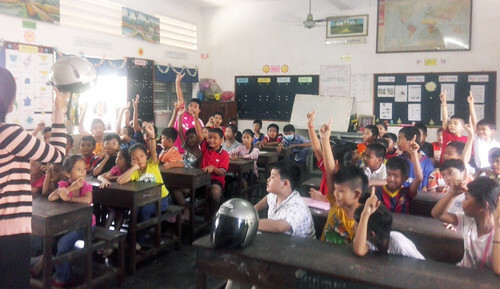 In total, The UPS Foundation is expected to donate over 17,000 helmets across Thailand, Cambodia, and Vietnam this school year, their fourth year of support for Helmets for Kids. Regardless of distance and time, attendees were encouraged to always wear a helmet on a motorcycle. On August 29, with support from AIP Foundation, the Union of Youth Federations of Cambodia, part of The Ministry of Public Works and Transport, organized a training workshop for 150 employees working at Sihanouk port. The workshop showed key risk factors of road crashes in Cambodia as well as simple actions motorcyclists can take to help prevent crashes and protect themselves from head injury. Mr. Kim Pagna, Country Direction of AIP Foundation in Cambodia, commented on his appreciation for the government’s efforts and recent approval of the draft traffic law, currently waiting for approval from National Assembly, and encouraged its swift enactment into law. 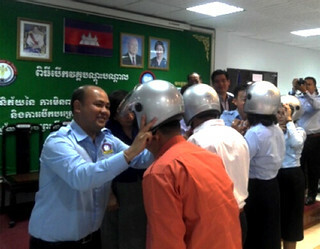 Over 70 University students attend a presentation to learn about the importance of Cambodia’s passenger helmet law. AIP Foundation’s internet campaign to collect pledges in support of Cambodia’s draft motorcycle passenger helmet law is making strides. The campaign, running until October 19, has over 1,500 pledges supporting the enactment of the passenger helmet law for all. AIP Foundation is promoting the campaign on Facebook and through emails to stakeholders, both of which lead to a webpage where they can pledge their support. Two presentations were recently given at Cambodia International Cooperation Institute (CICI) and Student Development Institute to increase University support for the passenger helmet law. With greater understanding of the impact of the passenger helmet law, AIP Foundation hopes to rally University support for the law’s enactment while also instilling positive behavior change among young adults. View the pledge campaign here. AIP Foundation introduces “Head Safe. Helmet On.” at a district-wide workshop. This month, AIP Foundation hosted two district-wide workshops to discuss the “Head Safe. Helmet On.” project in Cambodia supported by USAID with over 30 key stakeholders at each event. District- and commune-level government officials were present at the workshops to learn about why the specific target districts were selected. “The targeted provinces of Phnom Penh, Kandal, and Kampong Speu for the “Head Safe. Helmet On.” project were selected by looking at road safety ‘black spots,’ which are the most dangerous locations for road users. 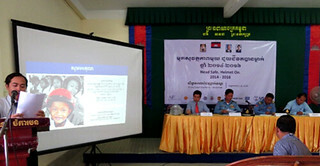 Together, these three provinces made up nearly one third of motorcycle fatalities in 2010,” said Mr. Pagna Kim, AIP Foundation Cambodia Director. Additionally, AIP Foundation defined stakeholders’ roles and responsibilities and discussed overall plans for the project. AIP Foundation begins helmet fittings at Aknu Wat Primary School for Manulife-supported Helmets for Families program later this year. Supporting AIP Foundation’s Helmets for Families program for two years, Manulife (Cambodia) Plc. has decided to extend the project for a third year and to another school in Phnom Penh. Prior to project implementation, AIP Foundation has begun conducting helmet fittings for future helmet distribution and helmet color preference surveys to help ensure helmet wearing sustainability. The Helmets for Families project will begin in November of this year. This school year 2014-2015, Manulife (Cambodia) Plc. will extend its support to Aknu Wat Primary School. Manulife (Cambodia) Plc. has supported Wat Preah Put Primary School and Sampov Meas Primary School in the last two school years, 2012-2014 . In October of 2013, a survey was taken at Wat Preah Put Primary School to determine the percentage of students on motorcycles and bicycles who wore helmets. The rate, at nearly 0% before program implementation, rose to 83% after Manulife (Cambodia) Plc’s helmet donations. In July of this year, the survey was conducted again, and the percentage has remained quite high at 73%. Dozens Die Throughout Country in Preholiday Traffic Accidents - At least 24 people have died and 44 have been seriously injured in traffic accidents across the country late last week and over the weekend, according to police, as Cambodians flocked to the provinces for the Pchum Ben holiday, which began Monday and runs until Wednesday. Statistics posted to the National Police website show that a total of 51 accidents were reported on Thursday, Friday and Sunday, resulting in 24 deaths, 44 serious injuries and 33 minor injuries. Source: The Cambodian Daily, 23 September.